I had a little bit of fun playing with Gelato's- that is a challenge with my SCS Stamping Addicts group. I learned this Rubbed Gelato's technique in June 2012 Technique Junkies newsletter.... It is a simple resist technique, but it packs alot of punch, don't you think? 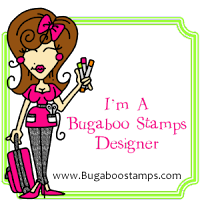 The stamps are by Technique Junkies (formerly Stamp Camp). The dress form is TH grungeboard that came pre-cut, covered with Gelato's as well. I added a little lace, then could not resist adding a bit of bling too. 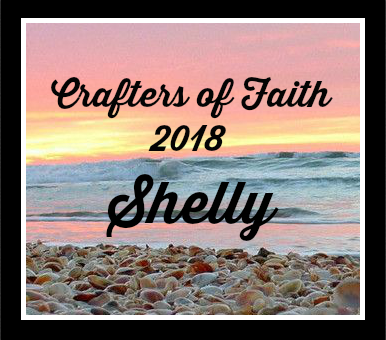 I am feeling quite blessed, and would love to share! I have a little Gelato candy for you today- if you are interested! These are the same Gelato's I used in my card above. Please be a blog follower this round, and if you post this on your sidebar, and come back and let me know, you will get a 2nd chance to win! Don't forget to leave me a way to contact you back! Shelly this is stunning - I must try that - gelatos are so versatile! 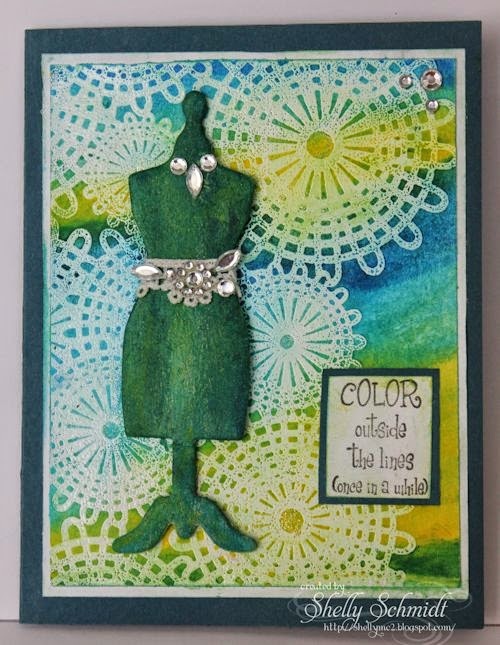 Love the background and the chip board piece is fabulous - love the bling. Like thinking differently and crafting that way. Love what you created here. Great project and great results. Shelly, what a lovely card. I like resist techniques. I have a couple gelatos but haven't done much with them. guess I should investigate them more or just play! thanks for the chance to win a set. Packs a punch is RIGHT!! SO lovely and really like the embossing over the gelatos. Beautiful! Shelly I love the background and the dress form with the bling is fabulous! I have not used gelatos, but am very tempted. Thank you for a chance to win your generous candy. I hope you have a lovely weekend. Fabulous card and that background looks amazing! Shelly, one word: "Stunning!" The colors are so vibrant and rich! Love the bling on the dress form too. Looks like I am going to have to buy some gelatos and see if I can give it a try. Thanks for the inspiration! What a great card and I love your background! Love the colors and the bling adds a very nice touch. 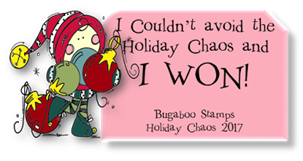 Thanks for playing our Anything Goes with a twist add an embellishment challenge at One Crazy Stamper! Such a lovely and inspirational card using both techniques which I have not attempted yet!!! The colours on your card look beautiful and the little lace bling is a nice touch. The candy you are offering is a dream come true for me if I win. I always wanted to use gelatos but because they are unavailable in India, I never got a chance. Wonderful and I love the technique! Great card featuring an awesome technique! Thanks for playing with us at One Crazy Stamper and good luck in the challenge.